The U280-C02-S2 Dual-Port USB Car Charger lets you quickly and safely charge two USB-powered mobile devices in your vehicle at the same time. 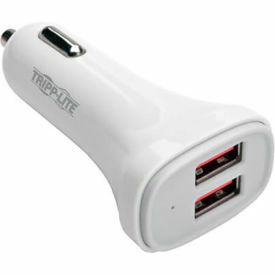 You and your passenger can connect your cell phones simultaneously to ensure full charges when you reach your destination. Also recommended for tablets, MP3 players and other USB devices, the U280-C02-S2 features two 5V 2.4A USB ports. The auto-sensing ports automatically adjust to the appropriate power level and platform, whether your device is an Apple, Android or other. This ultra-compact charger works with any standard 12V DC vehicle power outlet.